The Jackie Warner Diet is from celebrity fitness trainer Jackie Warner. She shares her successful approach to weight loss in the book, This Is Why You’re Fat (And How to Get Thin Forever). Warner says it isn’t your fault that you are fat, but that if you don’t do something about it then you are the only one to blame. In this book Jackie Warner provides dieters with a program that allows for fast results, without the need for extreme exercise or deprivation. The Jackie Warner Diet will help you to discover the behaviors that are making you fat and give you the information you need to lose the weight and stay thin for good. The book starts with a discussion about hormones and how they influence your tendency to lose or gain weight. Jackie Warner explains how we can control these hormones through diet and exercise, nutritional supplements and lifestyle strategies. The program commences with a two-week jump-start where surprisingly no foods are restricted and you actually eat more food to lose weight. All you do is add in specific foods every day including eggs, oatmeal, certain vegetables, fruit, protein shakes, herb tea, water and lemon juice. This will change your body chemistry and satisfy your body’s requirement for nourishment. In particular The Jackie Warner Diet targets sugar as a major cause of weight gain so nothing you eat is allowed to contain more than nine grams of sugar. You must read the labels on everything to ensure these limits are not exceeded. After the first two weeks you then move on to the 5+2 food plan where you eat clean for five days then enjoy two treat meals on the weekend. You should aim for five small meals a day, with protein included with every meal or snack. The Jackie Warner Diet includes guidelines for creating simple meals as well as complete menus if you love to cook. A sample food journal is provided to make it easy to keep track of your food portions. Chicken breast, turkey, lean beef, salmon, shrimp, eggs, goat cheese, cottage cheese, low-fat cheddar cheese, Greek yogurt, oatmeal, whole grain bread, brown rice, vegetables, fruit, nuts, seeds, avocado, flax seed oil, salsa, whey protein, herb tea, decaf green tea. Jackie Warner says that ‘less is more’ in regards to exercise and that you can achieve great results in just 20 minutes a day with interval intensity training. The Jackie Warner Diet discourages crunches and other exercises that work on small muscle groups because they are relatively ineffective at burning calories. The book includes examples of 20-minute exercise routines and a sample training log. This Is Why You’re Fat (And How to Get Thin Forever): Eat More, Cheat More, Lose More–and Keep the Weight Off retails at $24.99. Exercise routine is time effective. Dieters have flexibility to choose the elements of The Jackie Warner Diet that will work best for them. Two cheat meals a week make it easier to stick with the program over the long term. Some dieters may not enjoy all of the required foods such as eggs, oatmeal and protein shakes. Necessary to read food labels. 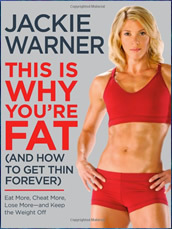 The Jackie Warner Diet allows dieters to learn about and experience Jackie Warner’s successful approach to weight loss. While following her method will require a certain degree of discipline there is also a large amount of flexibility built into the program, which makes it sustainable as a long-term method for weight management.